El Dorado offers a selection of 40 modern, yet spacious, self catering houses in Oudtshoornâ€™s centrally located and premier security estate. This Oudtshoorn accommodation facility includes a 24 hour reception, breakfast lounge, swimming pool and laundry service. You can choose between one, two or three bedroom houses. 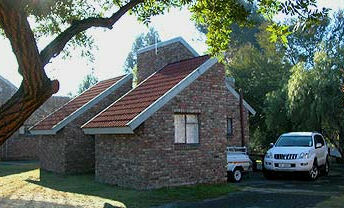 All houses have fully equipped kitchens, braai facilities, a private garden, satellite TV as well as Wi-Fi. The full buffet breakfast is an optional extra for R 120 per person. This can be delivered in a basket to enjoy in the comfort of your house. Alternatively, enjoy your breakfast in the breakfast lounge at reception.